What do you get when the Olympics and makeup combine? Some awesome beauty looks, that's what. 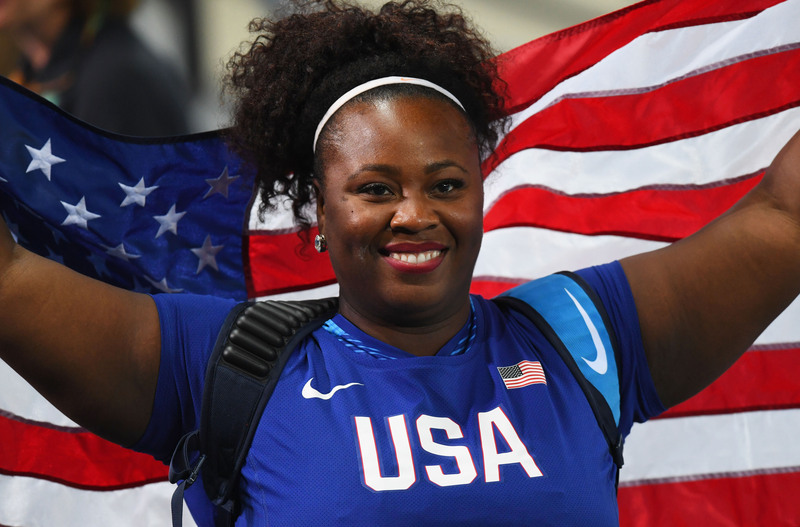 On top of winning first place in her sport at the Rio Olympics, shot-putter Michelle Carter is a professional makeup artist as well. The athlete often wears a full face of makeup to compete, and she has a pretty great reason for doing so. Among the amazing feats of athleticism, there have been plenty of great makeup and fashion moments at the 2016 summer Olympics, but Carter takes it to a whole new level. The gold medalist shot-putter, who goes by the name of Shot Diva on social media, actually is a professional makeup artist in her off-time. She's doesn't hold back talent- or makeup-wise on the field either. Carter has some awesome advice for anyone looking to follow in her footsteps. How awesome is that? It isn't to say that all women athletes should wear makeup while competing, but Carter makes it clear you don't have to choose between a love for cosmetics and a love for sports. She rocked a bold red lip and falsies for the Olympic finals, where she took gold for shot-putting. Her makeup looked just as stunning on the field as it did when she took the podium. That's not the only time she's showed off her makeup skills either. Check out some of her other fabulous makeup moments. Simple yet stunning all at the same time. Nothing like sparkly winged liner to start the competition off right. Everything from her brows to her lip color is absolutely gorgeous. Because sometimes a little clear gloss and mascara is all you need. No filter can fake a great winged liner. Just when you think it can't get any better, she throws in a dark lip color to the mix. If she could show me how to get that gorgeous braid, I'd be a very happy girl. She's even mastered the art of wearing makeup with glasses. Now let's just hope she comes out with some makeup tutorials soon!